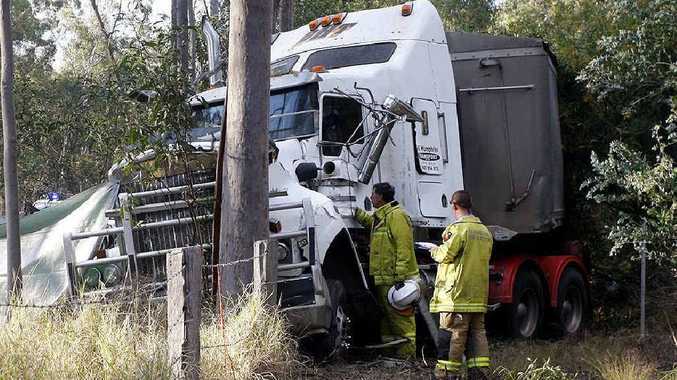 WITNESSES to a crash on the Cunningham Hwy yesterday desperately tried to save the life of a 52-year-old Victorian man. A semi-trailer carrying a 38-tonne load of urea fertiliser was headed south on the highway, just south of Aratula about 2.35pm, when it inexplicably veered to the left side of the road, flattening a large power pole and ploughing through a barbed wire fence before smashing into a large gum tree. Bystanders, including local resident Kennsy Behrendorff, raced to the cabin of the truck to check on the driver. Ms Behrendorff said several people commenced CPR while listening to instructions from emergency services over the phone. Paramedics arrived on the scene a short time later but could not save the man's life. Police will investigate whether a medical condition could have led to the crash. The forensic crash unit was called in try to find the cause of the tragedy - the second fatal road accident on Ipswich roads this week.